Posted by judylobo in Animal Video, Baby Animals, Central Park Zoo, photography, Wildlife, Zoo. 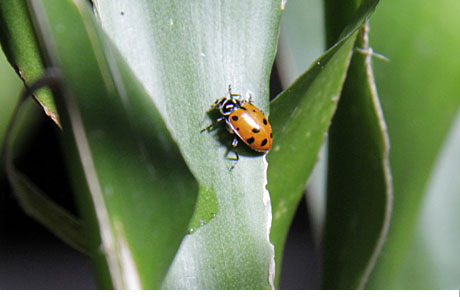 I had no idea that the nine-spotted ladybug was the insect of New York State until I read the article ‘Ladybug, Ladybug, Welcome Back Home: Good News for the Official State Insect’ – ‘It is not just any bug, but the native nine-spotted ladybug. And its reappearance is something of a relief, because it is the official New York State insect, even though the last recorded sighting of it in New York was 29 years ago’. Read the entire good news article here. Doing a quick search I found that there are many sites dedicated to ladybugs. Who knew? Here is a good site and was mentioned in the New York Times article. . Here are some frequently asked questions about lady bugs. I took these photos back on Sept 21, 2011 when the horticulturist at the Central Park Zoo released a gazillion ladybugs into the tropical rainforest as eco-friendly aphid control. It was fun to watch and those wonderful, industrious ladybugs work very quickly. Enjoy the photos. In case you missed the second video in the adorable Central Park Zoo Penguin Chick series – here it is. Life in the Penguin Nursery.